the traditionalistic customs of the Zelda franchise. Here's ten things Link can do in the Breath of the Wild. sets of clothing and equipment. by what you're wearing and which weapons you have equipped. that can be obtained by taking down enemies or stealing from treasure chests. pedestal to be used throughout the entire game. Rather, you'll have to regularly switch around your weapons, because sooner or later they'll wear down and break. Link can activate Flurry Rush mode whenever he successfully executes a perfect dodge. When this occurs, everything around Link becomes slow-mo, giving him the opportunity to perform rapid attacks that do great damage . and exchange items for money, putting a restraint on his hardened landscaping skills. It wouldn't be Zelda without puzzle-filled labyrinths. In Breath of the Wild there are ample sized dungeons overflowing with puzzles, enemies and bosses, but besides this there's also smaller dungeons called Shrines. Entering a Shrine from the main world will transport you to a Sheikah trial created by one of the mystical order monks. Fundamentally, the early shrines are a fanciful way of teaching you the basic fundamentals of the game, without all those prolonged speech bubbles. Link obtains a new device called the Sheikah Slate. It’s evidently not an tablet, but Zelda's producer Eiji Aonuma has defined it as a kind of technology and suggested that technology is the replacement to magic in terms of importance and relevancy. In terms of gameplay, the Sheikah Slate is where Link will handle and seek out his inventory, world map and quests. 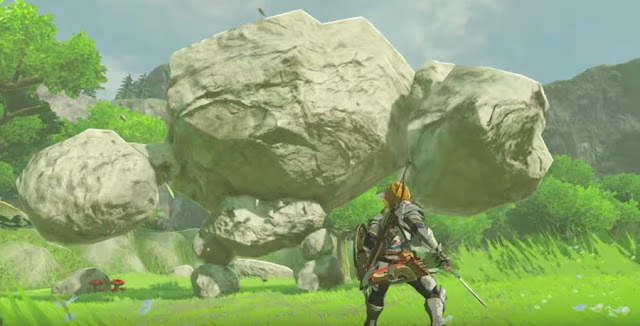 From a thematic outlook however, the enmity between technology and nature looks to be a crucial theme to Breath of the Wild. towards explosive barrels, which go out with a bang. which block the entry to hidden areas in the game. and smooth, Link can climb it. So buildings and mountainsides can be climbed onto. Still, it must also be known that climbing consumes your green stamina bar, so you won't be able to do it indefinitely. 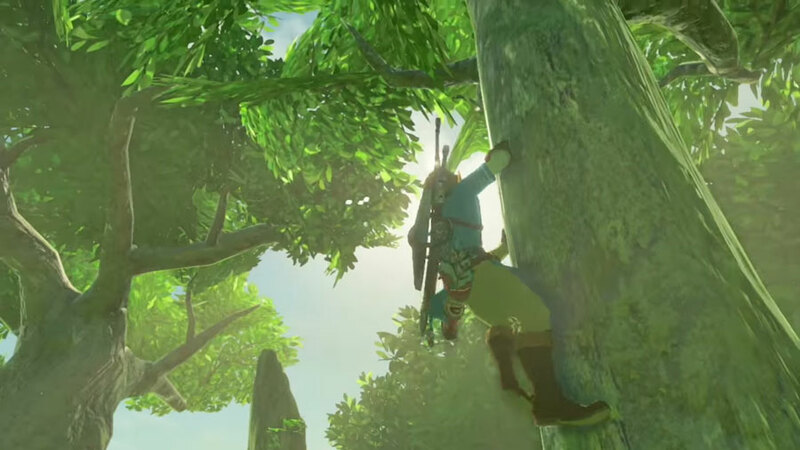 As stated Link can scale just about any unsmooth surface in the game, and that also applies to enemies. Previous Zelda games allowed you to sneak around, but Breath of the Wild takes it to a whole another level. For instance, you’ll want to conceal yourself in grass and crouch-walk to take out enemies/animals by surprise. The game also gives you a one-button kill opportunity when an unmindful creature is standing beside you. weapons then they’ll toss stones/rocks at you or just use their hands for close range combat. Beat The Game Without Playing It's Story. The Legend of Zelda: Breath of the Wild includes a monolithic open world that is just waiting to be explored in a number of different ways. Eiji Aonuma confirmed that players can reach the game's end content without experiencing BOTW's integral story. this method to players looking for the overall best experience. This looks absolutely brilliant. I haven't been this excited for a new Zelda game in years. If only it wasn't restrained to a shoddy nintendo console. I'm saying Nintendo should go third party and release their games on pc. I don't see that ever happening tbh, Nintendo have too much pride. The old Nintendo magic is still there. Wii U's version looked beautiful and oozed with charm and childlike wonder. I may have to pick up a Nintendo console just for this. Don't think I could justify buying a Wii U for one game. I'm considering looking into Nintendo's new console, not the Wii U.
Aunouma basically admitted that he was inspired by other RPG's, and it's a given with crafting, weapon degrading etc. Shame it's for the Wii U. It's for the new console as well. It's also for the new console. It feels like Nintendo is breathing new life into open world games. This is pretty much what I expected and more from a 3-D Zelda since first seeing Twilight Princess. Have you not played an open world game since the PS2 era? Yeah I have and none of them have gone into so much detail with so many systems in place. It literally looks like Morrowind with a cartoony art style set in the Zelda universe. There is nothing unique about it other than being Zelda. This game actually looks interesting for a Nintendo game, surprisingly. Surprising because it’s Nintendo from the last decade and doesn't have "smash" in the title. I love the great open-world look of the game, but I’m a bit disappointed about how EVERYWHERE seems to be uninhabited by people. No villages or towns at all? Is Link the last human being in Hyrule? They were specifically not showing any towns or villages because they didn't want to spoil anything story-wise. They are in the game. 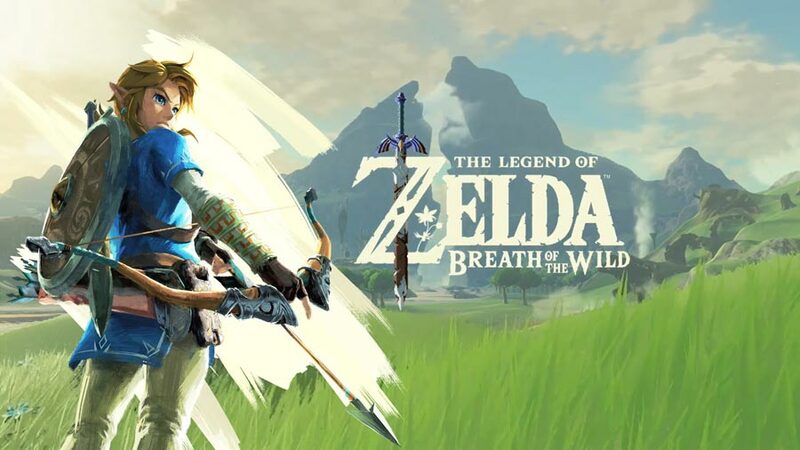 This game is just looking awesome, I can see why they have taken so long to get it out now, this isn't just a new Zelda with a new gimmick attached to it, this is a whole new type of Zelda game. The last time they experimented with Zelda in a big way like this was with Wind Waker. And obviously that worked. I am so getting this game, can't wait.